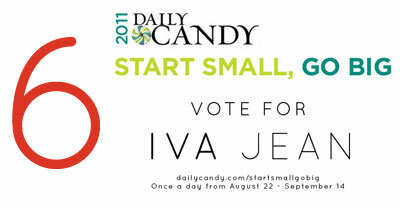 Just 2 days left to vote and I need your help today and every day through Sept 14. 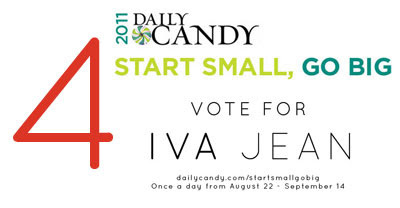 I'm so excited that Iva Jean is one of three finalists for the Daily Candy Start Small Go Big contest and hope that you'll help me become the Grand Prize Winner. 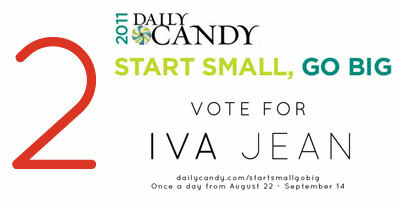 Just 3 days left to vote and I need your help today and every day through Sept 14. 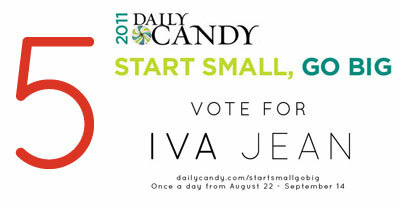 Just 4 days left to vote and I need your help today and every day through Sept 14. 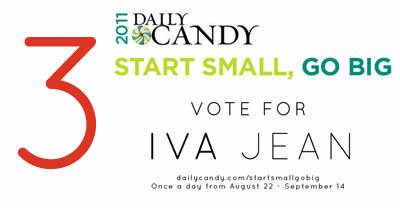 Just 5 days left to vote and I need your help today and every day through Sept 14. Just 6 days left to vote and I need your help today and every day through Sept 14. 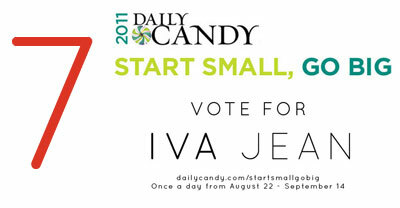 Just 7 days left to vote and I need your help today and every day through Sept 14. Hello to all my lovely readers. I know this has been few and far between lately, but I wanted to let you know that there is some big news for my new company, Iva Jean. I'm so excited to be one of three finalists for the Daily Candy Start Small Go Big contest and hope that you'll help me become the Grand Prize Winner. The Grand Prize Winner receives a day in New York City with industry leaders and mentors (Jonathan Adler and Sara Blakely, the founder of Spanx), as well as the boatload of press that goes along with Daily Candy. 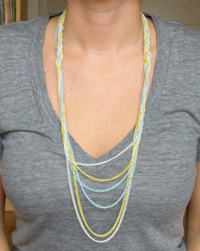 Please help me and my bike fashion and lifestyle company Iva Jean make it! I can't explain what an opportunity this is for me and Iva Jean. Please help me win this thing! I quit blogging on still dottie a little over a year ago and I've got some exciting news for those of you still paying attention. We've launched our first product over at Iva Jean - the Rain Cape. Designed to protect you from the rain with the style and personality you bring to every other aspect of your life. 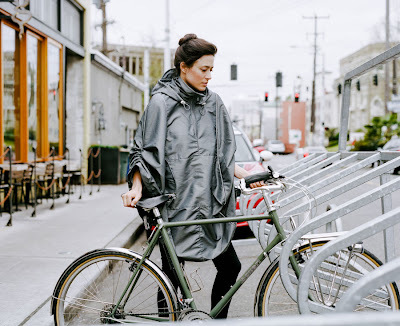 The Rain Cape provides a stylish and functional solution that works on and off your bike, proving that you are more than a cyclist. Continuing a legacy of timeless outerwear products produced in the Pacific Northwest, the Rain Cape was designed and made in Seattle, a place more than used to a little rain. On Sale Now - ready to ship September 1, 2011.
this week+ turned into a month - i can hardly believe the time has gone by so quickly. i could go on for hours about how amazing it has been to keep up this blog. it's a constant source of inspiration, a great way to get in touch with new people, a sounding board, an outlet, my baby, my collection, my voice. even though this blog is all of those things, this last month has not been a void. there are changes abound - a new job, a new project, & hopes of building my community here in seattle. for now, i hit the pause button on still dottie adventures.